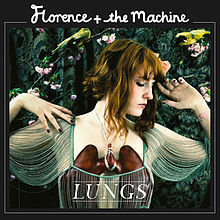 Lungs is the debut studio album by English indie rock band Florence and the Machine, released on 3 July 2009 by Island Records. The album debuted at number two on the UK Albums Chart for five weeks after its release. On 10 January 2010 the album returned to number two extending its stay at the runner-up spot to six non-consecutive weeks. The following week it reached its new peak position of number one for two consecutive weeks. So far it has spent sixty-five consecutive weeks within the top forty and thirty-three of those inside the top ten. It also peaked at number two for six weeks on the Irish Albums Chart. The album was a main contender for the 2009 Mercury Prize and received largely positive reviews from music critics. Additionally, it won the MasterCard British Album award at the 2010 BRIT Awards. Lungs has sold more than three million copies worldwide.